The gathering was a fundraiser for the Augusta Rescue Mission located only a few miles away from the event venue. Almost $40,000 was raised which would help provide meals to needy families for the holiday season. According to the Augusta Chronicle article, there were 325 people in attendance and keynote speeches were delivered by both Bill Curry plus former MLB pitcher, John Smoltz which were followed by autograph signings and photo ops. 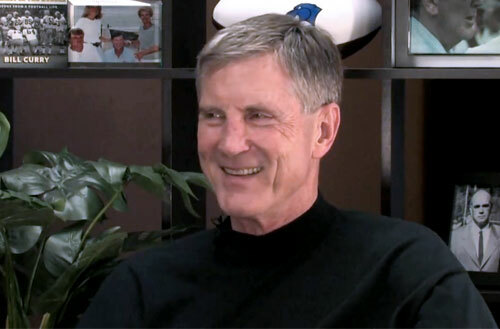 Bill Curry is a former pro football player who with the Green Bay Packers, Houston Oilers, Baltimore Colts and Los Angeles Rams from 1965 to 1974. Curry was the starting Center for the Packers in Super Bowl I and with the Colts in Super Bowl V and was an all-pro center with the Colts in 1971 and 1972. Curry was also head college football coach who coached for Georgia Tech, the University of Alabama, the University of Kentucky and Georgia State University. During his tenure at Georgia Tech, Curry led his team to a 9-2-1 record in 1985 and a win in the All-American Bowl. For his efforts, Bill Curry was named the ACC Coach of the Year in 1985 by the Associated Press and the ACC Sports Writers. Curry posted an overall 34-43-4 record over seven years at his alma mater, including winning seasons in 1982 (6-5), 1984 (6-4-1) and 1985. PFP Sports & Celebrity Talent Agency is a top booking agent for motivational sports speakers and celebrities. If you would like to book football stars like Bill Curry for a speaking engagement, personal appearance or special event, you can request Bill Curry agent and speaker information from PFP Sports & Celebrity Talent or call 800.966.1380.